Setting aside the shamelessness and ridiculousness of these headphones. 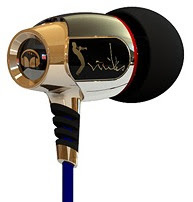 Why do I have the feeling that In-Ear headphones would be the last type that Miles would want to put his name on? In-ear headphones are just straight inferior to over-the-ear headphones. ::sigh:: I know, and I would never buy them, yet...gold! Numbered! Miles! (slapping self) I prefer over-the-ears myself but know people who swear by in-ears. It's said that after wearing them for an hour, you want to do a lot of coke, put your name on one of Bill Evans' compositions, and then punch your girlfriend in the face. Could be just a rumor. Looks like a golf club. I can't really deal with in-ears. They make the inside of my skull itch. That said ... I want these.